NASA Holds Cookout In Space, Plays REM Song : The Two-Way With Atlantis paying a visit to the International Space Station on the last mission of the space shuttle program, NASA thought it was a good time for a cookout... in space. The 10 astronauts on the two linked spacecraft will enjoy a special "all-American meal" today. 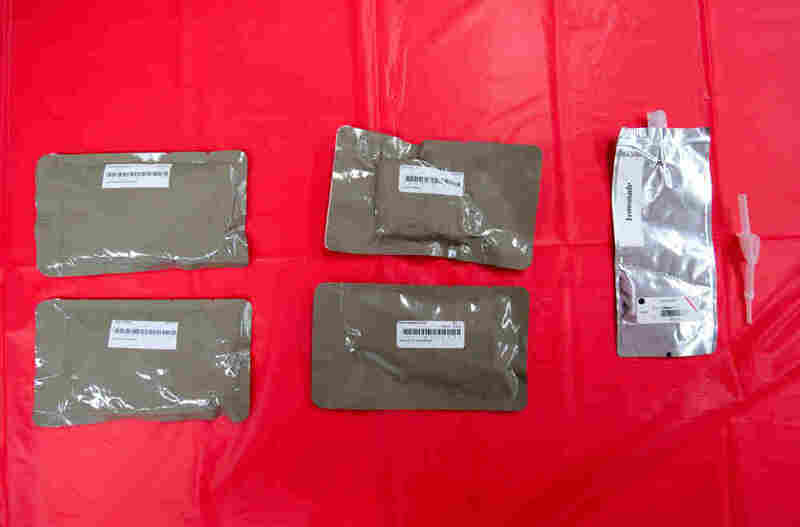 Food packets containing the astronauts' "all-American meal," including (clockwise from top left) corn, chicken, brisket, and beans, along with a lemonade, at right. With Atlantis paying a visit to the International Space Station on the last mission of the space shuttle program, NASA thought it was a good time for a cookout... in space. The 10 astronauts on the two linked spacecraft will enjoy a special "all-American meal" today. The meal — or, thermostabilized space food items, in NASAspeak — includes grilled chicken and barbecued beef brisket, along with Southwestern corn, baked beans and (unconfirmed) a Hostess apple pie. And in true cookout spirit, NASA welcomes the general public to share the meal. The agency urged the public to share in the virtual dinner, publishing its recipes ("formulations") online. I have to admit, it's the first time I've seen a recipe that looks like it was generated from an Excel chart. In new proof of America's finicky nature, shuttle crew members won't eat what the space station guys eat. "The shuttle crew will have the chicken while the station crew will have barbeque brisket," according to NASA. If you're looking for actual shuttle news, there's a shortage today, as the astronauts are getting most of the day off. I don't know why NASA has essentially decided to observe Bastille Day, but I'm sure the astronauts appreciate it. They'll even have crackers and brie to start their barbecue off, in what may seem like a joke — but isn't. The astronauts started their day with a serenade in space (!) from R.E.M. singer Michael Stipe. After crooning a few a capella lines of "Man on the Moon," Stipe wished the astronauts and NASA personnel a good morning, and good luck in the shuttle's final mission. The astronauts then heard a special version of "Man on the Moon," which Stipe recorded for the occasion. As he explained to the space agency, "I recorded 'Man on The Moon' for NASA in Venice, Italy, where Galileo first presented to the Venetian government his eight-power telescope, and in 1610 wrote 'The Starry Messenger' (Sidereus Nuncius), an account of his early astronomical discoveries that altered forever our view of our place in the universe."